This has to be one of my signature dishes. It is an all time favorite in our family and happily my daughter shares my love for hot spicy food. Chips has got to be the best accompaniment to peri peri chicken. Again as in much of our region, ingredients vary. 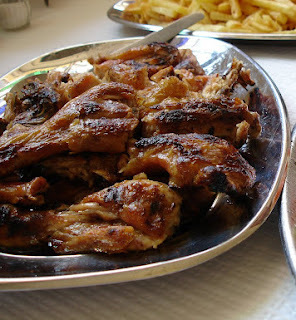 Peri peri chicken pork or prawns is different in the south of Mozambique to the northern regions. 1) fresh chillis for medium hot about 4 teaspoons heaped of chopped chillis. Use a mix of green, red, yellow if you can. Green have the best capsicum flavour without too much burn. De-seed the chillis if you want to reduce the burn by half. I like Jalapeno because they are nice and fleshy. As a general rule regarding varieties, the smaller the chilli the hotter. Therefore I find birdseye chillis far too hot without much pepper flavour. The nicest chillis to use are those patti pan shaped and sized ones. 2) 6 large segments of garlic chopped fine. 3) 2 tablespoons fresh grated ginger. the other ingredients which vary, but I use, is grated zest of a lemon. a half cup of fresh basil chopped fine. quarter cup very dry white wine or use wine vinegar. chop the spices fine and mix them. Add the olive oil and wine..
Chop the chicken into 4 pieces, ie. leg and thighs and breasts. Cut 3 or 4 deep diagonal slices in each piece. 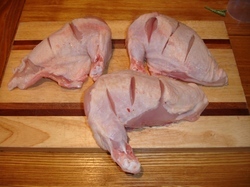 Put the chicken into a bag with the marinade and gently roll it until the chicken is well coated. I then take the chicken out and stuff the slices in the pieces with the spice mixture. Now slow grill for 40 to 45 minute. Keep basting it so it doesn't dry out. This is great served with chips or rice and a basil and tomato salad. Hey thanx for the comment! Each to his own. Your blog shows a lot of experience skill and insight. I have directed our beauticians at the Game Lodge I am working at, to your blog because they are always looking for ideas. They have Afro hair and unfortunately for them 99% of their work is with Caucasian hair That means all the products and processes they have access to, dont have a lot of use for themselves.